This week’s challenge is Bokeh. And Oh how I love some Bokeh in my images! However you might be asking yourself… What is Bokeh? Well in simple terms Bokeh is the part of the image that is blurred. Usually the background is blurred and the subject is in focus. 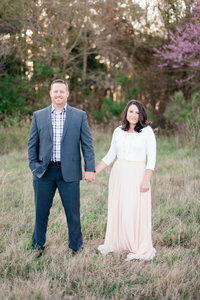 Luke & I have heard numerous times from clients how they LOVE that blurred background. Well now you have a term for it! Bokeh! ( Pronounced BOH-Kə or BOH-kay ). If you are a photographer just getting your feet wet and you too want to achieve that creamy background then there are a few things you have to keep in mind. 1). Lens. You will definitely want to use a fast lens. Meaning having an aperture of 2.8 or faster. I remember when we first started shooting we would stick around the 4.0 aperture. We were so worried about getting everyone in focus. Which is the most important! Then we got braver Luke got braver. He started shooting at a 2.8 then a 1.8 and now sometimes a 1.6!!! I will be honest I was scared to shoot so wide because I wanted to ensure my subjects were completely in focus. Now I don’t even think about it. However, it does come down to your camera body and again lens. I know on my Mark ii the images are just not as sharp. It might be because my AF points are limited. However on the Mark iii using the same lens ( 85 is my favorite)!! I get awesome sharp images at 1.6! I seriously am in LOVE with that nice creamy background! And one more thing with the lens. The 70-200 is AMAZING!!!! It is a 2.8 but the compression is to die for! Luke usually shoots with this lens. He will stand back and then zoom all the way in CRUSHING that background and it is GORGEOUS! Another tip is sometimes you might not have a lens that shoots at 1.6, 1.8. This is Ok. That creamy background also depends on how far away your subject is to the background. And so I shot with the 24-70 at 2.8 and because I kept my subjects away from the background…. I was able to get that BOKEH that I so LOVE! Isn’t that background LOVELY??? And that everyone is in FOCUS!! Yay!! !